You’ve got to Get In to Get Out—How Facing my Fears has Helped Me Heal. For 15 years, I have been shying away from sharing my story. In 2003, I was diagnosed with an advanced form of a rare chronic disease called syringomyelia, in which the grey matter of the spinal cord erodes, creating a fluid-filled cavity within the spinal cord, known as a syrinx. I was told that there was a good chance I would die on the operating table. There was also a good chance I would never be able to walk again. Even if I survived the necessary surgery and could walk, I would still be living with this disease. At 31 years old, that news was a lot to take in. Thanks to the deep spiritual work I have done over the past 15 years, I am able to see my disease as my gift, as my greatest teacher. A painful teacher, yes, but the most important teacher in my life. Almost anyone I meet on the street that I share just a piece of my story with says, “Curtis, you have to share your story.” I knew I had to, but recurring anxiety and depression stopped me. I knew I needed a nudge to move forward. I needed help. And, as synchronicity would have it, Heather Box and the Million Person Project appeared before me one day and presented the opportunity to attend a six-month story coaching program. Unfortunately, I didn’t have the $3,000 required to attend. I was surviving on social security, and all of my funds and attention had been going toward alleviating the symptoms of my disease. I was merely surviving day-to-day. I already had a stack of medical bills I could not afford to pay. And then of course, there was my pride, something I knew I needed to reel back in. The solution was to ask for help and to be vulnerable—two things I really didn’t want to do because they made me uncomfortable. Along with Heather’s suggestion, my intuition told me to start a GoFundMe campaign. I could engage my precious collection of social media contacts to help me fund my participation in the program. I don’t think there was a greater fear within me. It felt so uncomfortable to reach out in that regard, and I imagined there would be no turning back once the action was taken. I wondered if this was indeed the time for such a drastic action. I never thought in a million years that I would do a crowd-funding campaign. Perhaps if I was stranded in some foreign country and it was life or death and there was no other possibility, I might have considered it, begrudgingly. Yet now was the time to take this leap of faith. You’ve got to get in to get out. This is the healer’s understanding, a practice I embrace and integrate on my journey: going into the fear and pain in order to get to the other side. We need to learn to stay with what disturbs us, and learn to move toward it. This is usually a sign of the deeper work we need to do for our growth, for our healing, for the change we so desperately seek to experience within ourselves and in the world around us. Culturally and socially, we tend to avoid this work, for this is where the shadow lurks. It can be a rather uncomfortable, volatile, and reactive energy to work with, but it is within this work we often find the most transformative and sometimes miraculous types of healing and transformation. In the Kalama Sutta, Buddha teaches us not to take anyone’s word at face value. He emphasizes the importance of taking action on what you find worthy and determining its efficacy amidst your own experience. There are so many things that inhibit us. Perhaps it’s a conversation with someone you have been avoiding, where communicating a need and expressing a vulnerability is something you have been shirking. Perhaps it’s taking a chance on something that frightens you, or maybe it’s showing up for something that is unsettling. It could take the form of asking for a raise, signing up for an audition, asking someone out on a date, jumping out of plane, being in a room with spiders—whatever it may be, we all have fears. Learning to go into these feelings when the opportunity presents itself, to stay with them and take inspired action while having them serve as a guide can lead to a different outcome. It can lead to a different way of being and the deep healing we all seek. Having different experiences and experiencing different outcomes with the discomfort we feel is where the power of this wisdom and transformation may prove itself. For me, doing this crowd-funding campaign and sharing my story has been an important step in integrating a healing perspective and moving toward the fear I feel, rather than away from it. What is that step for you? What fear can you move toward today? Curtis John Mitchell is a wounded healer, Shamanic practitioner, a Mahasati Meditation practitioner, and a life coach. 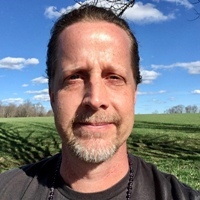 He holds certifications as a Talat Healing practitioner and Reiki Master and teacher, as well as a psychology degree from Syracuse University. He has studied the Alexander Technique for many years amidst many other healing modalities in his 15-year quest to alleviate personal suffering. Connect with him on Instagram.